With less than 48 hours before Bayside High School’s Leadership Workshop staff was going to welcome more than 80 delegates Saturday morning, the student leaders’ to-do lists were long. Rehearse lines in skit practice. Practice dance steps for staff introduction. This is on top of the homework, athletic practices, jobs and family matters they also have on their lists. However, no one was panicked. No one was stressed. At least no one was showing it — especially not Ashley Williamson, government teacher, SCA adviser and leadership workshop coordinator at Bayside. This is the eighth leadership workshop she’s coordinated at Bayside with a student staff, and she’s had years of experience planning leadership workshops, dating back to her days at a student leader at Ocean Lakes High School (OLHS). The 1999 OLHS graduate served as SCA secretary and SCA president in addition to being a student athlete and volunteering her time with other activities. But Williamson admits she didn’t foresee that as a rising ninth-grader. She credits great teachers, her principal and her SCA adviser for inspiring her and for providing multiple opportunities to learn, lead and give back to her school. Now she is the one fostering such opportunities for high school students, and the 16 students serving on the leadership workshop staff are learning valuable lessons from the experience as she did. Williamson (holding T-shirt) stands with workshop staff members. Jalina Sabado, senior, agrees. “I think the biggest thing I’ve learned is working with others. Even though I might not be the best of friends with someone, the ultimate goal is those delegates this weekend,” she said. Sabado also knows that her experience working with groups will help her when she graduates high school. “Working with colleagues in college and the workplace will be easier with the things I’ve learned here,” she added. “I hope that something just lights their fire for being involved because it just takes a little something for you to want to be involved later,” said Nieves. Giving back to their school is what Williamson likes to hear. “It’s about leaving Bayside a better place,” she said. Her student leaders also give back to other schools by supporting leadership workshops at middle and elementary schools they attended. 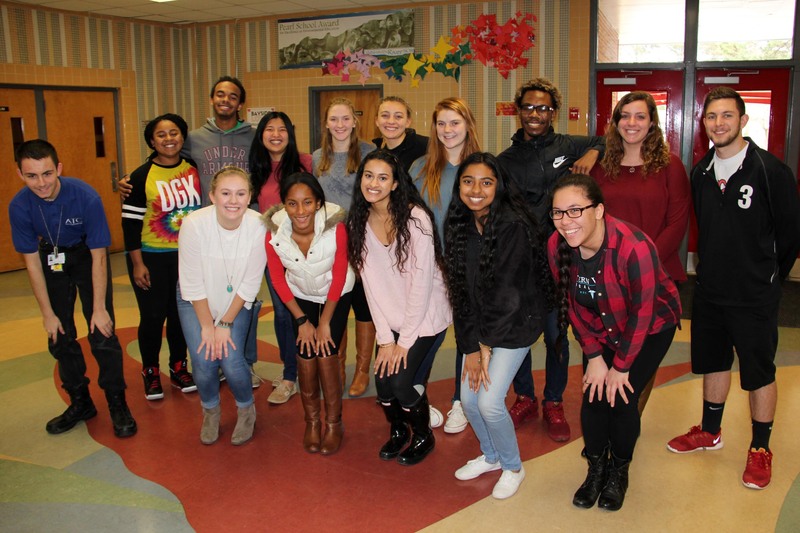 The Bayside High School leadership workshop is supported in part by a Virginia Beach Education Foundation (VBEF) grant underwritten by Nancy and Robert DeFord as well as the Virginia Beach Education Foundation. To learn more about how you can support innovative and creating learning projects through the VBEF, visit www.vbef.org or call 757-263-1337.